Available at a fixed price. First Group run the local bus services. The 1,1a & 501 run from Weymouth to Portland. Only the 501 runs all the way to Portland Bill. With Chesil Beach on your right and the harbour on your left; (approximately 1½ miles). Follow signs to Easton. This takes you up a steep hill through Fortuneswell. The road continues up for approximately one mile to a roundabout in front of the Heights Hotel. Take the 2nd exit signposted Easton. 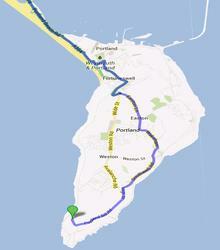 From Easton follow signs to Southwell and Portland Bill â€“ stay on this road for approximately 1½ miles. You then come into Southwell and a small roundabout by the Eight Kings pub. Turn left towards Portland Bill. After 1 mile. You will come to the second of 2 very sharp left hand bends, on this bend there is a sign for the Portland Bunkhouse (right hand turn leading sharply up the hill). The lane runs towards a large white house. Drive PAST the white house and you will see a compound with a low building inside it on the right. This is the Portland Bunkhouse. Please park within the compound or in the parking area opposite the gates. It is fitted with sensor lights for late arrivals. Please do NOT call in at the white house.